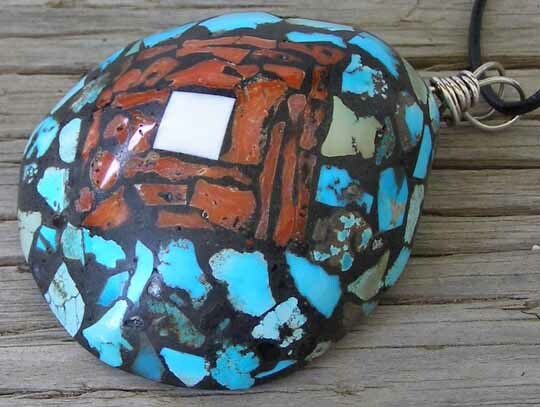 Bryan Tomsometimes does traditional silversmithing in the Navajo style, but he also makes mosaic inlay work in the style of Santo Domingo Pueblo. This pendant consists of mosaic inlay tiles built upon a shell of white clam. This design uses tiles of Kingman turquoise, Mediterranean red coral and a center diamond of white clam shell. The tiles are set in traditional jet paste matrix. Bryan included a cowhide cord with this which is simply tied off by hand. We also include a 20-inch leather cord with this which has a lobster clip for easy closure. Length of cord shown in photo: 20"
Total hang with bale: 3 1/8"